The demand for UK passenger rail services in the 12 months to December rose by 5.0% to reach a total of 1,639 million trips. The increase from 1,560 million journeys in the previous year is twice the 2.5% for annual growth on which long term network capacity planning is based. Improved economic growth and mild weather conditions resulted in a 6.7% increase in the final 3 months of the year with particularly strong growth in London and South East where journeys were up by 8%. In this period travel using InterCity longer distance services increased by 5.1% with 3.1% more passengers using regional trains. In terms of passenger kilometres the increase for the year was 4.3% giving a national total of 61.8 billion, compared to 59.2 billion in the previous year. The average journey length fell slightly from 40.0 to 37.7 kilometres. The figures for London and the South East mean that this part of the network accounted for 70% of journeys and 48% of distance travelled in the year. Long distance journeys amounted to 8% of users but reflected 33% of distance travelled. The balance for regional trips which includes Scotland and Wales was 22% of journeys and 19% of passenger kilometres. Revenue performance also improved with fare box income increasing by 9% on the year to reach £8.6 billion which reflected average income of £5.26 per journey compared to £5.19 in the previous year. The election of a Conservative Government committed to an early reduction in the national current account deficit is likely to result in a fall in the Department for Transport budget which in 2014 was set at £15 billion covering £8.6 billion in capital expenditure and £6.4 billion for working expenses across all transport modes. Although the £38 billion Network Rail budget for Control Period 5 is likely to be secure additional funds to provide for further capacity enhancement to meet greater demand growth is unlikely to be forthcoming particularly given undertakings to maintain ticket prices at current price levels for the 5-year term of the Parliament. Up to now potential congestion has been mainly countered by lengthening trains and the introduction of new rolling stock for both Thameslink and Crossrail services will provide a cascade of vehicles for use elsewhere which will allow this policy to continue. 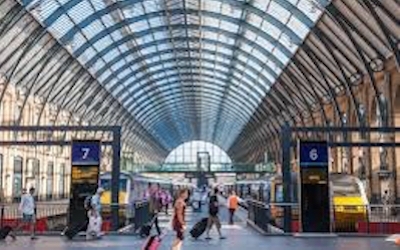 Congestion at stations is difficult to resolve in the short term and measures such as Crossrail 2 which will remove substantial passenger numbers from Waterloo, Liverpool Street and King’s Cross stations will be needed. The new link in Central Manchester between Piccadilly and Victoria stations, and the Edinburgh – Glasgow Improvement Plan are among others schemes to enhance network capacity. More of these projects will be needed. With its deep understanding of characteristics of the network, FCP is well placed to identify priorities for investment to meet rising demand and funding options.